This is the official mission logo. Click on the image to download an encapsuled postscript file from our public ftp site, it's called blast2.eps (a compressed version is also available). This cruise was a continuation of the BLAST 94 mission in order to verify findings from the first cruise. In addition to all compounds that were measured during BLAST 94, we added some other halogenated methanes. The cruise led our team through the Atlantic ocean, covered an equally wide latitudinal range as BLAST 94, similar oceanic regimes such as coastal and coastally influenced waters, upwelling regions and open ocean gyres, but slightly different seasons, fall in the northern hemisphere and spring in the southern hemisphere. The entire cruise was almost 5 weeks long and was conducted between 18 October, 1994 and 21 November, 1994. The data for methyl bromide basically confirmed what we saw during BLAST 94 and contributed valuable information to our database for methyl halides. From left to right: Jim, Laurie, Shari, and Jürgen, just arriving in Punta Arenas, Chile. 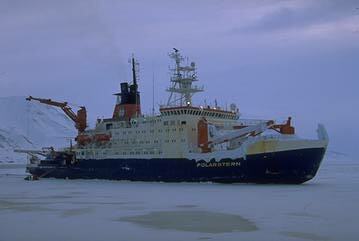 The FS Polarstern operates out of Bremerhaven, Germany, and is run by the Alfred Wegener Institut für Polarforschung mainly as a research vessel and supply ship for the German Antarctica station Georg von Neumayer. The ship is 105 m long and 25 m wide. It was put into service in 1982 and is run by a 41 hand crew, with a capacity of up to 40 scientists. The ship is designed to break through ice of up to 4 m thickness and is supplied with, amongst others, two helicopters, several heavy-duty cranes, and space for 16 containers. BLAST II is shown in red through the Atlantic Ocean, out of Bremerhaven, Germany into Punta Arenas, Chile. The distribution and cycling of halogenated trace gases between the atmosphere and ocean, J.H. Butler, J.M. Lobert, S.A. Yvon, and L.S. Geller, In: G. Kattner and D.K. Fütterer (eds. ), The Expedition ANTARKTIS XII of FS Polarstern in 1994/95, Reports of Legs ANT XII/1 and 2, Berichte zur Polarforschung, Vol 168, 27-40. Bremerhaven, Germany: Alfred Wegener Institut für Polar- und Meeresforschung (1995). 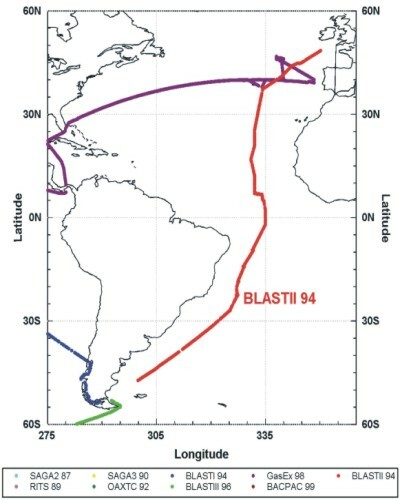 BLAST 94: Bromine Latitudinal Air/Sea Transect 1994: Report on Oceanic Measurements of Methyl Bromide and Other Compounds, J.M. Lobert, J.H. Butler, L.S. Geller, S.A. Yvon, S.A. Montzka, R.C. Myers, A.D. Clarke, and J.W. Elkins, NOAA Technical Memorandum ERL CMDL-10 (1996). Data from this cruise can be downloaded from our public ftp site at ftp.cmdl.noaa.gov, subdir /hats/ocean/blast_ii.